This is a fun way for students to use the vocabulary to learn the vocabulary. The first vocabulary list in chapter 4 is all about competencias. 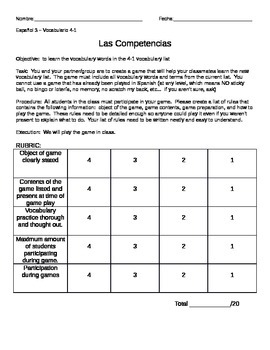 I decided that a fun way for students to learn the vocabulary was to create their own "competencias". The object of the game is for students to create a game using the vocabulary words. The game must be an original, must be safe to play in class and must include as many students at one time as possible. You are downloading the explanation paper that I give to students that also includes the grading rubric. You can adjust the point total to work for you! This can be used for different languages as well.